Deep underwater in southeast Mexico there is a sign which warns divers that anyone who swims through the underwater caves could face death. But that did not faze underwater photographer Lisa Collins, from Essex, England, who threw herself into the water to capture the scene. This network of flooded caves, known as the Yucatan Cenotes, is one of the world's deadliest diving spots. The underwater caverns were created when sections of land collapsed on the Yucatan Peninsula, creating sinkholes called cenotes. 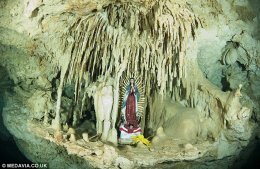 At one time, the caves were used by the Mayans for human sacrifices. The cave of Las Calaveras, which means skull in Spanish, holds the remains of more than 125 skeletons. 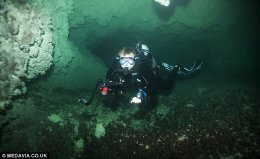 Since the 1980s, fewer than half of the estimated 6,000 caves on the peninsula have been explored and mapped by divers. Many of those who have ventured into the 2,400 caves have died in the process. 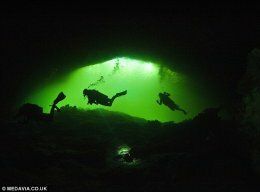 Divers who have perished include a Canadian who lost his life in the Cenote Kalimba in February 2013 and a Brazilian husband-and-wife team and their Spanish guide who died in one called Chac Mool in April 2012. Ms Collins, 48, described visiting the area as like being in 'outer space'. She said: 'There is no sense of being in water because there are no currents. 'In the sea, or on lakes, you can feel the water moving around you, but in a cave it is completely still.' The expert diver said that the most important skill when swimming in the cave is to remain calm. She said: 'You can lose track of which direction is up and which is down, so it is very disorienting.' Ms Collins described the moment she squeezed through a tiny space when entering the Chac Mool. Some of the caves were roped off - with a written warning of the dangers of diving in them. 'Seeing the sign with the grim reaper on it made me realise how dangerous an environment I was in,' she said. Another cave explored by Mrs Collins was plunged into complete darkness because it contained a mysterious sulphur cloud which blocked all daylight. The cloud is caused by a build-up of sulphur and hydrogen which separates freshwater in the upper part of the cave from saltwater. In the deepest parts of the water, there are bat bones, tree stumps and roots. Mrs Collins said it would be dangerous to dive too deep - in case the swimmer became tangled in vegetation.